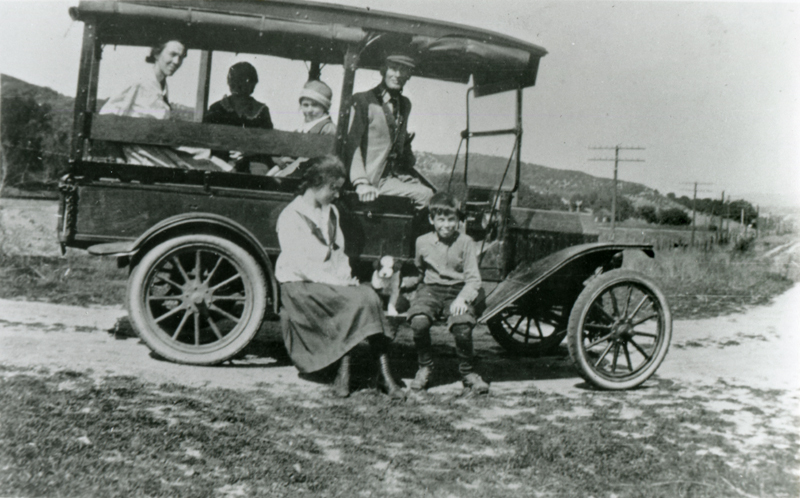 In this 1918 photograph, Newhall merchant S. David Dill is seen behind the wheel of the Santa Clarita Valley's first high school bus. Prior to the 1946 opening of William S. Hart Junior and Senior High School, children from Newhall and Saugus had to travel to San Fernando (some did so by horse or bicycle) if they wanted to pursue an education beyond the eighth grade. Some Soledad Canyon children attended high school in the Antelope Valley. Meanwhile, Dill's wife, Mattie V. Dill, operated the bus that ferried lower-grade students to and from the K-8 Newhall School. AP0729: 19200 dpi jpeg from copy print.